For us here at SDE Weddings®, Toronto’s premier wedding videography, cinematography and photo booth group, few things are finer among a year’s worth of work than a beautiful wedding day to close a splendid summer season. With the long summer sun setting shorter and shorter, and the gust of September’s winds calling for the coming of fall, a perfect memory is ripe to take place in such a twilight time between the seasons. And such is how we retell the story of Sarah & Aaron, a wonderful young Chinese couple whom our videographers and cinematographers had the pleasure of working with just this past September 29th, 2017 at their absolutely auspicious wedding ceremony and celebration held at a fairly new venue for us, the Copper Creek Golf Club in Vaughan, just a stone’s throw away from Toronto, and two perfect photo-shoot sessions; one at the Kortright Centre for Conservation, a favourite wedding destination in Vaughan, and another at Copper Creek, wrapping everything together perfectly. 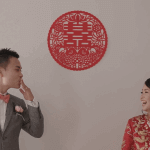 Sarah & Aaron, a lively young couple, had held a perfectly planned Chinese wedding; complete with the fun and excitement of the morning’s door games, to the solemn and traditional atmosphere of the tea ceremony – two special scenes that our wedding videographers and cinematographers know all too well from experience. So join us as we recall some of our most prized and memorable moments of our videographers and cinematographers in capturing Sarah & Aaron’s truly magnificent and unforgettable wedding day, along with a review of some of our favourite scenes from the special day, and a preview of the festivities in our specially made same-day-edit highlight reel from Sarah & Aaron’s truly perfect wedding ceremony and celebration. Here is the same day edit wedding video that we made for Sarah & Aaron’s wedding at Copper Creek Golf Course. Our videographers’ and cinematographers’ work on Sarah & Aaron’s perfect September summer/fall season wedding day began in the early hours of the morning, with our videographers and cinematographers arriving at the bride’s beautifully spacious house for the beginning of the traditional Chinese wedding day door games. An always and ever-exciting experience between bridesmaids, groomsmen alongside the bride & groom-to-be, our videographers and cinematographers captured the door game activities in full, and created a selection of fun footage featured in our same-day-edit highlight reel. An added plus with same-day-edits, especially with door games, is that the morning’s hijinks is on full display during the dinner reception screening, one of the final parts of the wedding evening. This gives our videographers and cinematographers’ work the duty of wrapping up the full day’s events nice and neatly, as well as spelling out the magic of the day between start and end. And alongside one of the most traditional tea ceremonies we’ve filmed, Sarah & Aaron’s day was one for the books for our videographers and cinematographers. Sarah & Aaron had chosen to hold their wedding day ceremony and celebration at a fairly new venue for our videographers and cinematographers, the Copper Creek Golf Club in Vaughan, a vast-stretching golf course set on a gorgeous Vaughan valley. A favourite scene from the day from our videographers and cinematographers is Sarah & Aaron’s first look, taking place just by the golf course’s greens, where the soon-to-be husband and wife tee’d off the day perfectly. Also included were breathtaking shots of Sarah & Aaron’s walk through the forest, an unforgettable scene that’s beyond description, and Sarah & Aaron sealing a kiss as we transition to the couple’s solemn vows to seal the deal. 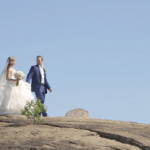 A perfect scene captured by our videographers and cinematographers, Sarah’s descent down a flight of stairs to the outdoor ceremony as a teary-eyed Aaron gazed in anticipation for the ultimate moment. And as the perfect pair shared their solemn vows together, showcased in the highlight-reel and same-day-edit, the crowd couldn’t help but erupt in applause for Sarah & Aaron in a marriage made complete in front of the couple’s closest family and friends, and a first kiss to perfectly capture the most touching memory of Sarah & Aaron’s wedding day. A memory to last a lifetime. With the day winding down to a close, Sarah & Aaron took a trip to one of our favourite Vaughan destinations; the Kortright Centre for Conservation, where the newlyweds held an intimate photo-shoot and video-taking session alongside their bridesmaids and groomsmen, making ever-more special scenes from a truly special day. 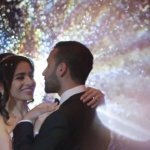 And with the couple’s first dance held at the Copper Creek, and our highlight-reel and same-day-edit showcased for family and friends, our videographers and cinematographers couldn’t help but be happy. Both for Sarah & Aaron on a dream come true, and on a job-well-done in documenting a genuinely unforgettable experience. And on top of that, Sarah’s brother had also booked us after the wedding to work on his own wedding day! So stay tuned for that. So all in all, we here at SDE Weddings®, Toronto’s premier wedding videography and cinematography group, wish Sarah & Aaron the very best in their lives and future together. We thank them truly for giving our videographers and cinematographers the honour in filming their unforgettably magical wedding day, and we hope that our work with them on their truly special day will always stay close to their hearts all throughout the seasons.